We all know that neglectful, dysfunctional, and/or abusive parenting patterns can have long-term negative effects on children. Marianna Klebanov draws on new research to explain just how deep and significant the effects of bad parenting actually are. San Francisco, CA (March 2015)—We all intuitively know that the way a child is parented has a deep and indelible impact on that child’s life. But now, thanks to ever-more-detailed brain scans and scientific research, we’re learning just how important parenting actually is. What happens during a child’s formative years directly impacts the brain’s growth and development—and not always for the better. Parenting affects intelligence and education. As Klebanov has pointed out, a parent’s nurture (or lack thereof) affects the growth of children’s brains, as well as their ability to learn. Research has also amply demonstrated that children who receive corporal punishment (yes, this includes spanking) score lower on IQ tests and other tests of cognitive ability. Parenting affects career success. When we struggle with problems in our careers, their roots can often be traced to childhood issues. Of course, lack of education, which in itself limits an individual’s career path, can be a consequence of arrested cogni¬tive development caused by less-than-optimal parenting. Parenting affects morality. Parental affection and attention matter much more than many of us realize. Research has shown that fast responses to infants’ cries, physical contact and affection, breastfeeding, and co-sleeping all help children grow up to become adults with mature moral development, including a developed sense of empathy and moral sensitivity to others. Parenting affects violence, crime, and war. When a child is parented with violence, neural connections form in an unhealthy fashion. (Klebanov states that violent parenting certainly includes severe trauma, but also covers “less serious” practices like spanking and slapping.) In particular, the child’s brain becomes overwhelmed with stress, leading to faulty stress response systems that contribute to irrational behaviors such as hypervigilance, violence toward others, and revictimization. 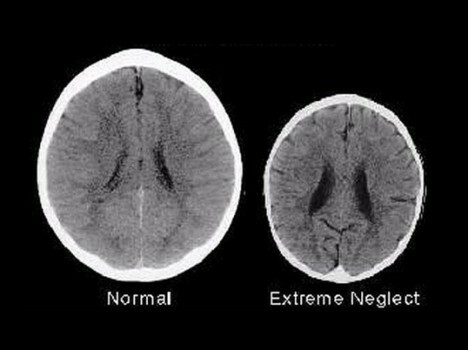 And once again, brain scan studies demonstrate that trauma during development stunts the growth of the child’s brain in various ways, which can lead to violent behavior due to limited cognitive abilities and difficulty controlling aggression in a healthy manner. Parenting affects mental health. As Klebanov has explained, childhood trauma caused by parental mistreatment can lead to a host of mental health dysfunctions. And in fact, many studies have shown a significant link between childhood trauma and mental illness. Parenting affects addiction. Studies have shown that adverse childhood experiences lead to an increase in addictive behaviors. Parental substance abuse, as well as the need to dull the pain caused by one’s own childhood maltreatment, may lead to substance abuse in the victimized individual. Frequently, children of substance abusers themselves replay their parents’ patterns. Parenting affects relationships. The relationship between a child and his or her parents serves as the foundation for all of that child’s future relationships. Infants and small children need to experience love and positive attachment behaviors from their primary caregivers in order to conduct relationships optimally throughout life. If these things are not present, children may grow up to be too needy or attached, too critical, withdrawn, unreliable, inconsiderate, and more as they recreate the earliest relationship they experienced. Parenting affects physical health. Childhood trauma is proven to cause numerous physical illnesses and disorders including cancer, severe obesity, ischemic heart disease, chronic lung disease, skeletal fractures, and liver disease. It can lead to accelerated aging and inflammation, and has also been linked to chemical sensitivities and allergies, autoimmune diseases, and osteoarthritis. Parenting affects personal economics and the economy as a whole. Children whose parents are strict about money and anxious about not having enough (whether because of actual circumstances or due to fear-driven thriftiness) grow up in an environment of limitation and stress, which may impact the child’s status with peers, ability to concentrate on studies, and feelings of anxiety. Believe it or not, the negative impact of a parent’s financial concerns can begin even before birth. For example, if a pregnant mother is concerned about the cost of raising the child she is carrying, this concern will reflect itself in the stress hormones and chemicals that are released into the body she shares with the child. Parenting affects prison costs, defense costs, and healthcare costs. While Klebanov has touched on these consequences of negative parenting already, their impact on spending (both public and private) is so significant that they deserve to be mentioned on their own. Marianna S. Klebanov, JD, is the coauthor of The Critical Role of Parenting in Human Development. She works as an attorney with a specialty in matters relating to child welfare and family violence. She writes a column forExaminer.com on issues relating to parenting, child abuse prevention, and brain development. In addition, she serves on the Board of Directors and on the Executive Committee of Family and Children Services, a large nonprofit organization focusing on mental health services. Klebanov chairs the organization’s Program Committee, overseeing the board’s relationship with the organization’s mental health and counseling programs. She is the legislative liaison to the Board of Supervisors for the Juvenile Justice Commission and serves on the Child Abuse Prevention Council. Klebanov graduated with honors from Berkeley with a bachelor’s degree in linguistics and earned her JD from the University of California at Hastings, where she served as a journal editor. To learn more, please visit www.anewconversationonparenting.com.